History books might tell us the American Civil War began in 1861 and ended in 1865, but literature tells us differently. Narratives of captivity and slavery, sermons, revolutionary tracts, novels and visual texts of the 19th century reveal a century of civil warring. Literary forms changed to represent the changing form of the nation. Narrating the market revolution, slavery, wartime, reconstructions, and urban growth, how did sentimental novels, realist novels and Boy Scout adventure novels project different plot lines for the American story? Did different genres hold out different visions for the 20th century? 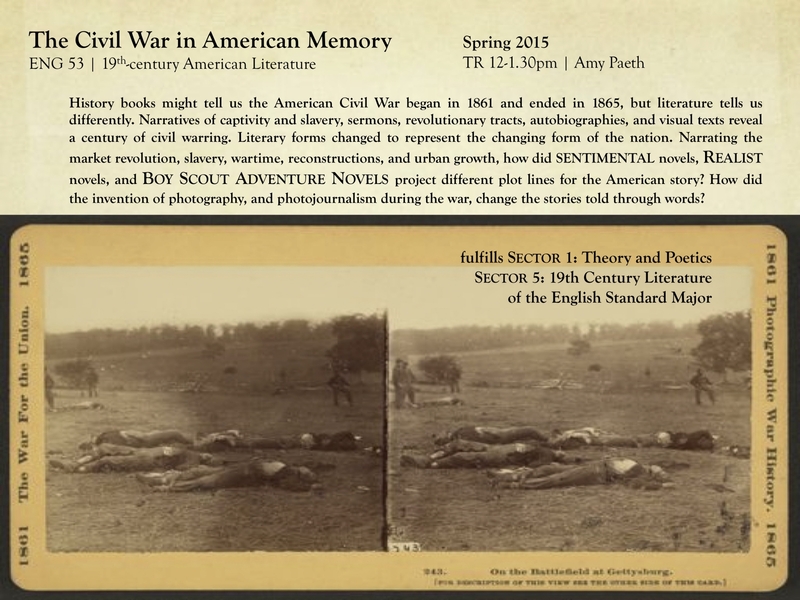 The Civil War was the first major conflict extensively photographed: how did the invention of photography and photojournalism change the war told through words? We will survey core texts that make how we remember the Civil War, and understand what it means to be American, today, including Gardner’s Photographic Sketch Book of the War (1865–66); Emerson and Thoreau, Frederick Douglass, Nathaniel Hawthorne; Emily Dickinson, Longfellow, Poe; Henry James. Assignments: a short paper analyzing a literary passage and/or visual image; an in-class presentation; a final paper.